Cherry pickers in Gloucester and Leeds have been no strangers to adventure in the past few weeks after two models were commandeered, once by criminals and once by the crime-fighters trying to apprehend a thief who had got himself into a tight spot. 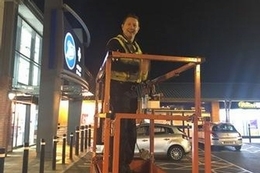 Gloucester Live reported that earlier this month a group of youths took a cherry picker for an illicit spin around Quedgeley Retail Park, an out-of-town shopping centre, before police intervened, with one social media wag teasing that he betted “that was the cherry on top of a fun shift” for the police officers involved. Similarly, inews reports that on Christmas Eve, a criminal got stuck on the roof of a Greggs bakery after trying to break in. After agreeing to come down – albeit not before causing around £2,000 worth of damage – a cherry picker was used to apprehend the thief and take him to safety.